In December you could read a post about wedding and wedding dresses here on the blog but after Christmas and New Year's Eve, I think it is more than actual. Tell me Lovelies, who of you got engaged during the festive season. ;) Maybe you or your best friend? First of all congratulations and secondly I might can help you with the right dress. a leading wedding dress and occasion dress manufacturer. They do not only wholesale but also retail business and have more than 15 years of expertise. All of their products are quality guaranteed. 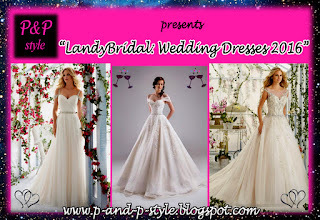 LandyBridal helps you to "make your dream wedding come true". Beside the wedding dresses they offer among others bridesmaid dresses, flower girl dresses, mother of the bride dresses, wedding suits and wedding accessories, so it is worth to have a look at the site. In this first collage I collected three of my favourite from the wedding dresses 2016 section. All of the dresses above feature a sleeveless design but the necklines are different. The first dress has straps and offers a lovely sheath-column shape. The second one does not have any neckline and it features an A-line. The third dress has an illusion neckline and a nice A-line shape. If you are a fan of vintage clothes, you probably have a different taste of the perfect dress. On the site you can find beautiful vintage lace wedding dresses which ones are great for a lovely bohemian wedding. There are so many beautiful decorations in this theme. Maybe one day I will post some of them. But now take a look at my favourite vintage dresses. Doesn't matter which dress you are wearing on your big day. If you feel good in it, your inner beauty will glow and all eyes will be on you. 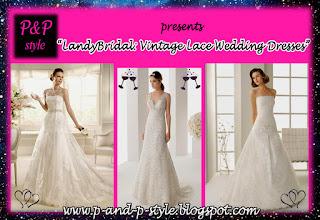 If you came to the decision to buy something from LandyBridal, pay attention to the sales. They have special offers and also Weekly Deal Wedding Dresses. You can find dresses with more than 50% discount, free shipping and they have a bundle of dresses for less than 150 USD. Wedding dresses are SO beautiful! I love these. How lovely wedding gowns from Landybridal! I am in love with that last one. I would love to buy my wedding gown from this site. Thanks for the reviews! Hey, I also need some reviews for some event venue NYC. I wonder if you can share some reviews! Thank you, Mark! :) Please email me more about it and we can discuss.